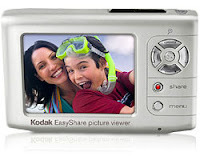 The Kodak EasyShare picture viewer has a nice clear screen, built-in memory, as well as the ability to take memory cards, and an intuitive set of controls and menus. It's let down by the Kodak EasyShare software in my opinion. All I want to do is put photos onto the viewer, and to do that I have to use this big klunky software package, that wants me to add all my photo albums, which I already have nicely organized in Picasa. Having added a group of photos I then have to tag ones as favorites - again something I've already done over in Picasa - for them to be uploaded to the viewer. Having said all this, once the pictures are in the viewer, it is very easy to use, and clear to see the pictures. I tried to find a way to use the device just as a USB drive. With the EasyShare software removed, Windows XP recognizes the device, and gives you an icon. But clicking it just shows 3 files, none of which are the images I had on it. And it wasn't possible to add further files. After a few google searches I did find a reference to the Kodak Connectivity Software that is included with the EasyShare software. If you already have the EasyShare software installed, you can read more about this here C:\Program Files\Kodak\Kodak EasyShare software\ReadMeCamera.htm. To install it you must select Custom, and remove everything except for the Connectivity Software option. In fact, I could only get it to work by removing the EasyShare software entirely, rebooting, then re-installing and going into Custom and only electing to install the Connectivity Software. Having done this and rebooted I now have a new drive that let me access the Picture Viewer. There was an "Internal Memory" folder which contained all the images I had already put on it. Unfortunately everything is read-only, and it won't let me make it read-write. So I can't add any additional images. I was able to verify that the EasyShare software is resampling the images before moving them onto the PictureViewer. This probably accounts for why the transfer seems to be so slow, and may well justify putting up with the EasyShare software. For me the disadvantages of this device is that it doesn't come with a recharger. Instead it must be recharged from a computer via USB, or via the purchase of a very expensive recharger. This effectively makes it useless for the one purpose I was hoping to put it - which was to give it to my mother-in-law who doesn't have a computer. Also, even if you can get around the recharger issue, you can't move images from a memory card onto the internal memory without transferring them to the computer and back. Meaning that I would have to take a notebook with me when we visit our mother-in-law just to transfer pictures from our camera to the device. It's not obvious to me why someone would buy one of these rather than an inexpensive color PDA or something like an iPod - both of which it would seem can do everything this device can, and lots more. I only have it because KodakGallery sent it to us for spending so much with them over Christmas.